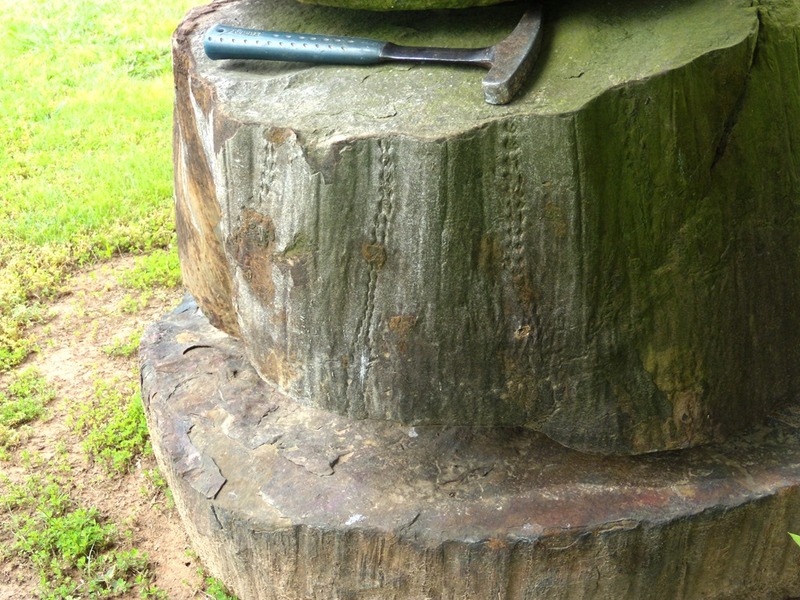 The above picture is of a syringodendron, the fossilized trunk of a giant tree-like fern that lived in Arkansas in the Pennsylvanian Period (318 to 299 Million years ago). The Pennsylvanian Period is a sub-division of the Carboniferous Period of geologic history which was so named due to the preponderance of lush vegetation that existed at the time. Because there was so much vegetation , the geologic record for the Pennsylvanian period is coal-rich and also preserved a lot of plant fossils. This syringodendron was rescued from an abandoned coal mine in Scott County Arkansas by the land’s owner prior to the land being reclaimed. Syringodendron is a Sigillaria trunk that has lost its bark prior to fossilization. The double impressions that run vertically at regular intervals are called Parichnos scars, or “hare’s trails” colloquially. Between the vertical impressions are slight linear protrusions called ribs. If you examine the top edge of the fossil, the ribs give a wavy or undulating shape to the margin of the trunk. This entry was posted in #geoblog, GeoPic of the Week and tagged Arkansas, Carboniferous, coal, Fossil, Giant fern, Parichnos scar, Pennsylvanian, plant-fossil, Scott County, Sigillaria on May 29, 2018 by argeology.